I always love to bake and cook. It has become part of my life and how I always wish that I can have more time to spent on experimenting new recipes everyday. I like to try out new recipes but my first choice of the recipe to try shall be something that my kids would enjoy eating. I have started baking cream puffs 10 years ago. It was a recipe shared by a friend of my mother in-law. 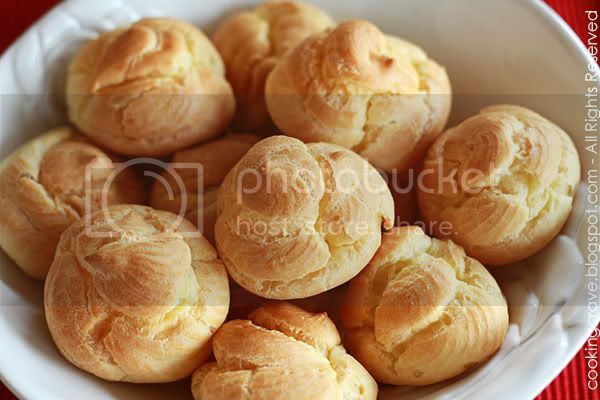 I use to bake cream puffs with her recipe until recently I think I have found another great one from KITCHEN CORNER. Thank you so much Grace!! In a cooking pan bring to boil water, butter, pinch of sugar and salt. Off the heat, add in the plain flour and mix with a wooden spoon until well combine and become smooth dough. Add in half of the beaten eggs and keep stirring until the egg mix into the mixture. Once the eggs completely mix with the dough, you will find it quite dry and hardly to mix. Continue add the beaten eggs slowly, little by little into the dough and continue mixing. You might not finish using the beaten eggs. Transfer it into a piping bag and pipe out about 20 dollops of mixture on a baking tray lined with baking paper. Bake at 200'C preheated oven for 15 minutes until it puff up then turn the temperature to 170'C and bake for another 15 minutes. Transfer the puff on a wire rack to cool down. Boil the milk with sugar in low heat until sugar dissolve but not boiling. Meanwhile, mix the egg yolks and flour into thick paste but no lumps in it. *Add two tablespoon of milk if you find it too dry to mix. Pour the dissolve warm sugar milk mixture into the egg yolks mixture. Pour slowly, little by little and mix with a hand whisk until everything well combine (*strain the mixture if necessary) Then, pour back the mixture into the cooking pan. Cook in very low heat and keep stirring until it thicken. Transfer the custard into a plate and cover with cling film. Make sure the cling film touch on the mixture, this is to prevent it from skin forming on its surface. 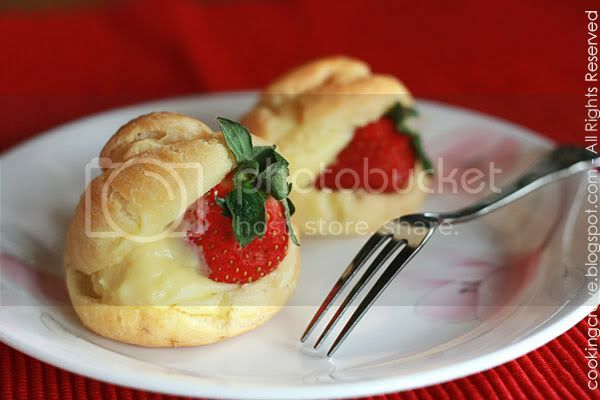 To assemble the cream puffs: Spoon in some custard fillings then sandwich it with some strawberries. Chill the puffs in the fridge before serve. p/s: This recipe needs a lot of stirring. A very good hand exercise... hahaha! As usual, very nice shots, and very nice puff, looking forward for the recipe ya, Thanks in advance. I like to eat the cream puff this way too! Adding some fresh fruits make it very refreshing. You've nice shooting and make me mouth watering now. Hey Amy, can i come to your house now? u r really enticing us la... hahha... keep on posting... u r really wonderful! Looks so yummy and great pictures! Your cream puff looks so tempting. Would you please share the recipe? I have been wanting to try making cream puff for the longest time. 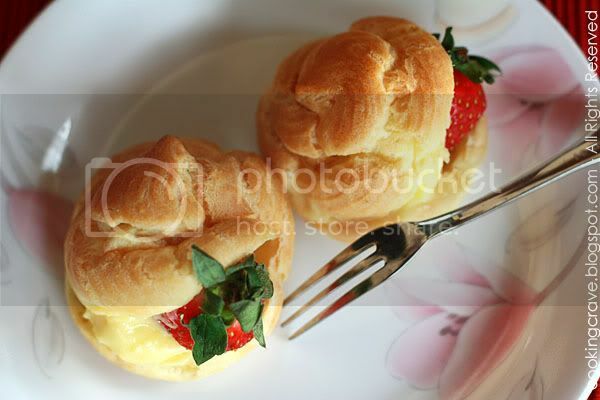 You have just inspired me to give it a go, your cream puffs are gorgeous, and you took great pictures! Your cream puffs are perfect and the cream inside looks yummy! My my, this look so yummy. I wish I could cook like you and Sonia! :o) Your food photography is really pretty too. i heart cream puff! how 'd u make it? mine sharing up recipe? They look beautiful and delicious!! Cheers !! You have got an award for your lovely food blog. Pick it from my blog. Heloooo? Are you back yet? Miss you already.. haha! The cream puffs looks so tempting larrr.. Is the recipe for cream puff and chocolate eclairs the same?? Gorgeous photos and I love these lovelies. How beautiful your photos! I'm impressed! Cream Puffs!!!! My favorite! My Great-Grandmother always made cream puffs for the holidays! This brought back memories. Thanks! Looks great! I'll try it one day. Thanks for sharing. by the way, can i use custard powder for the filling instead?